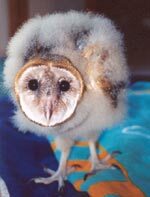 It is our great pleasure to help these animals to become independent again and return back to their natural way of life. 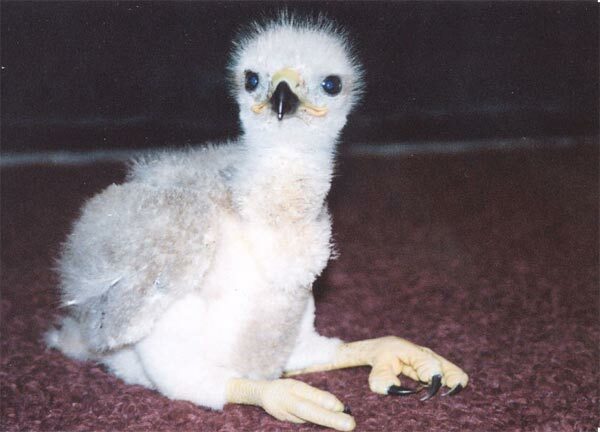 Raptors are an awesome carnivorous bird that keep our populations of mice, rats, rabbits, bugs and even skunks under control and maintain the balance of nature. We are a nonprofit organization that would love to have you be a part of this effort. Our goal is to educate our community at the same time that we work to build more flight pens for rehabilitation. 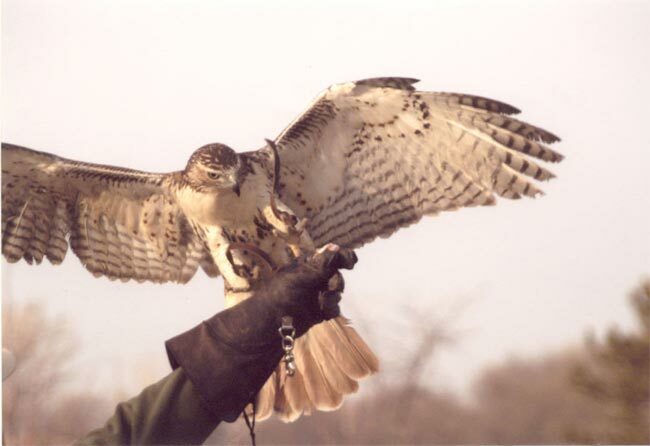 More and more of us each day are discovering the importance and the beauty of Raptors. If you would like to join us in our efforts, visit our "SUPPORT" link for information on how you can help. 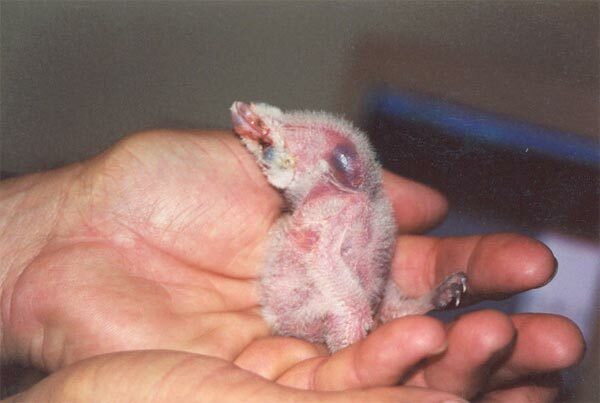 Birds that have been hit by cars, caught in ice storms, shot, orphaned as babies or any other event that may cause them to become hurt, or too weak to hunt. 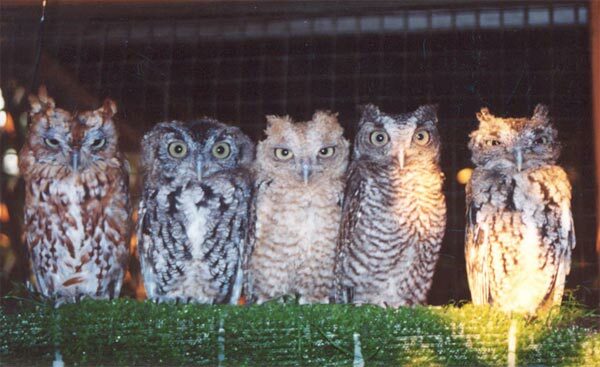 We receive these birds from Kansas Department of Wildlife and Parks, US Fish and Wildlife Service, Zoos, Veterinarians, Animal Control and the General Public. We supply these animals with veterinarian care, food, warmth, nutrition and a place to heal and become well enough to be returned to the wild. In the event you find an injured raptor, always contact a licensed professional. 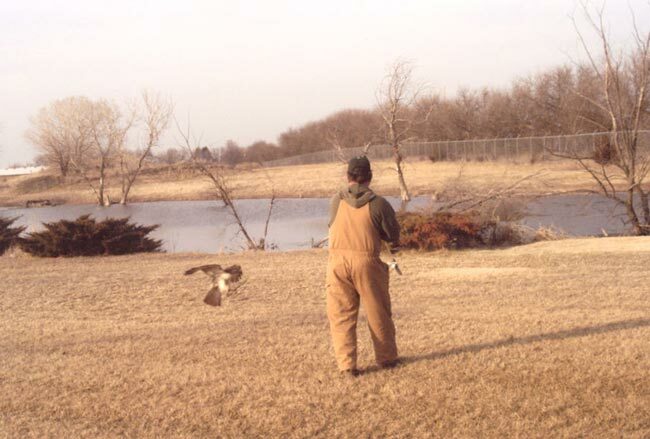 It could be the US Fish & Wildlife Service, Kansas Department of Wildlife & Parks, Animal Control, Local Zoo or a Licensed Rehabilitator such as EVRC. If you must handle a raptor, first cover the bird with a blanket or towel to reduce the visual stimulation of the bird. Protect yourself with heavy gloves and safety glasses. Gently fold the birds wings into its body with your two gloved hands and firmly lift the bird into a transport container. Injured Birds are quite unpredictable, and you need to be aware of its sharp talons and beak. This could be a cardboard box with a towel on the bottom so it may hold onto something with its feet, a plastic pet carrier will also do. Never use a wire cage. 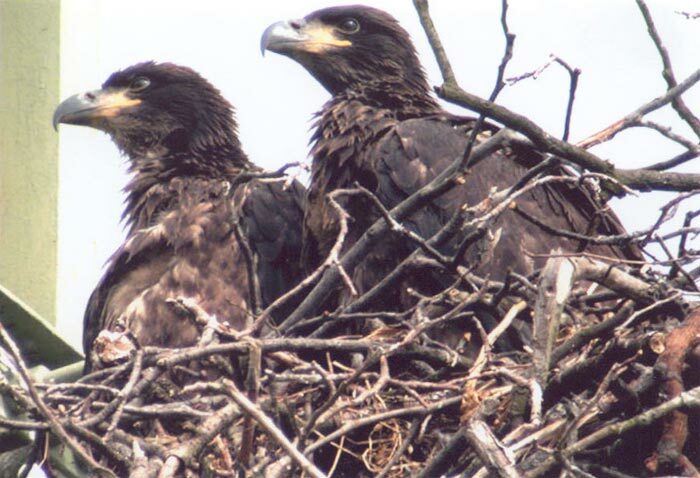 This will damage the feathers and any soft tissue that is exposed. The carrier should be slightly larger that the bird. 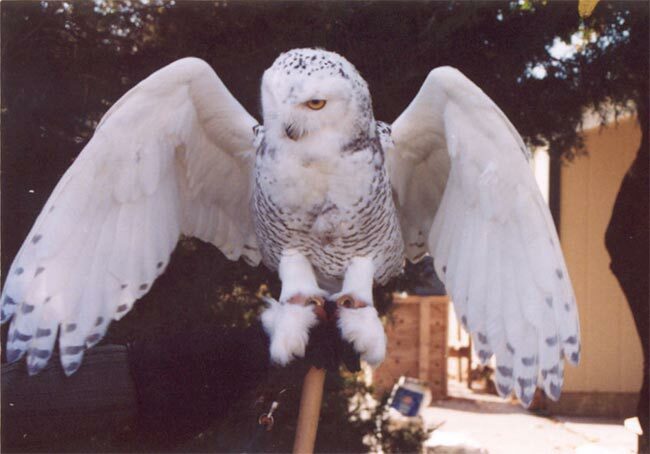 The less room that the bird has to move, the less likely it will cause more injury to itself. Do not feed the bird! 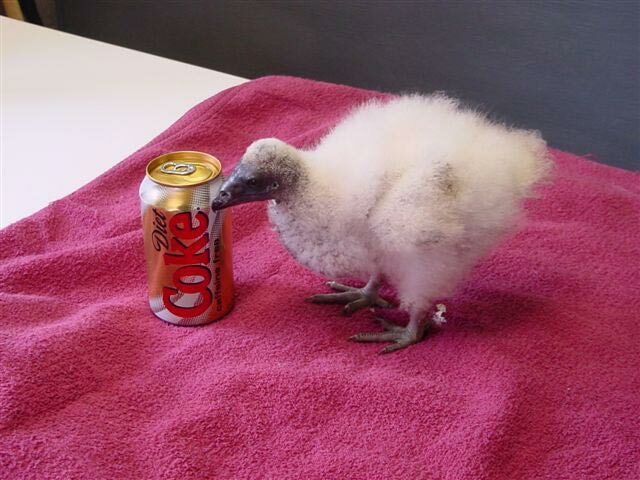 Chances are it is dehydrated and an attempt to feed it may worsen its condition. Place the bird in a quiet and dark area while awaiting transportation to a rehabber. Keep away from Children, dogs and cats any loud noises. Stress can reduce its chance of recovery. 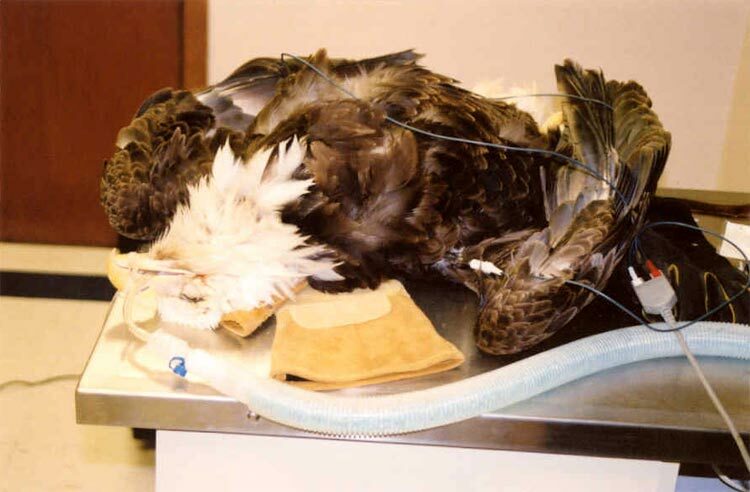 These pictures are of a Bald Eagle that had lead poisoning. We had to tube the bird and are actually cleaning out his crop in the picture below. He was too weak to turn it over so the food was getting rotten and we had to clean it out. Talk about a nasty smelly procedure! Yuk! It was near death when we got it. The picture of me holding it was taken 1 month later. Notice the green color on the tip of the tail. That is a sign of lead poisoning. It causes the kidneys not to work properly. 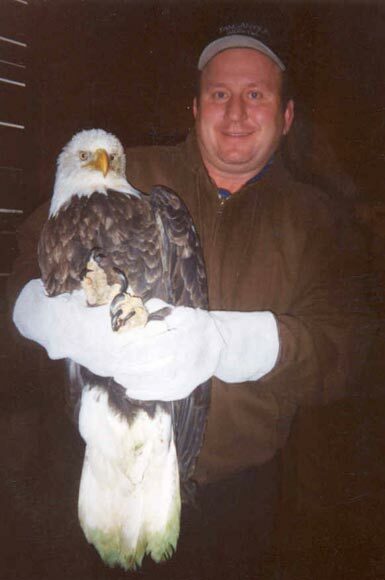 We released the Eagle almost a year after we received it in Colorado. 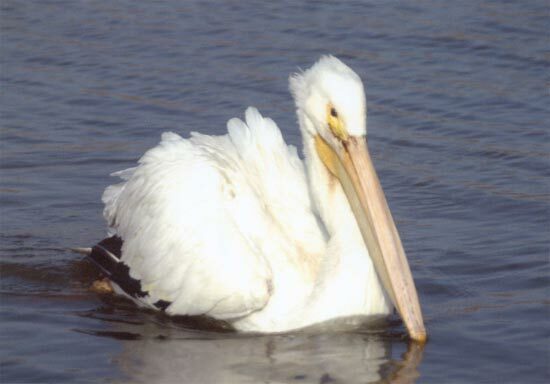 This was a Pelican that was shot near Milford Lake. We rehabbed it and called him Mr. Peabody. 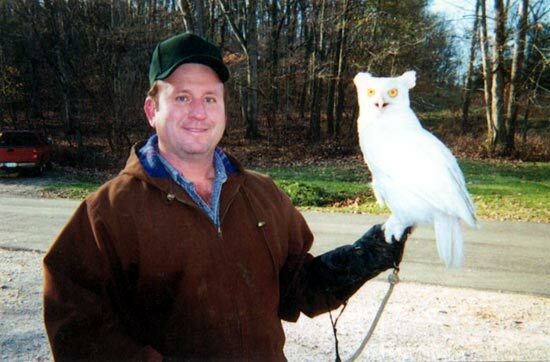 The owl was an Albino Great Horned Owl that was at the World Bird Sanctuary in St. Louis. before it was ready to be released.